This pressure gauge is a double-strength unit that is shatter-resistant with 2-1-2% accuracy at ANSI Grade A. This pressure gauge is liquid-filled and can resist vibrations of all sorts. It reads up to 100 psi at a given time. A Bourdon tube pressure guage is an analog device whose mechanism is so widespread that often it is simply called a pressure guage. 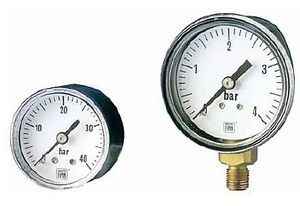 These guages are suitable for use in any industrial environment. They function reliably under harsh conditions and can measure both very high and negative pressures. Since they do not respond well to rapid changes, they are best suited to situations where pressure remains relatively constant. The Bourdon tube is a curved tube which straightens under pressure. A geared mechanical linkage transmits this movement to a needle, which indicates the pressure on a calibrated dial. The tube may be filled with liquid or gas, depending on the application. Choice will depend on conditions of use: typical and extreme values of the pressure to be measured, whether measuring gas or liquid pressure, operating temperature range and nature of the environment (clean or corrosive).